Sad news last night with the death of Alan Gordon. A graceful and elegant Scottish striker in an era when Scottish strikers were often not graceful and elegant, Gordon was most closely associated with Hibs. It was at Easter Road that he spearheaded the brief, but still fondly remembered, era of Turnbull's Tornadoes. Gordon actually played more games and scored more goals for Hearts - his 23 goals driving the Tynecastle bid for the 1964/5 title that they lost only on goal average - but it was once he crossed the Edinburgh divide that he seemed to find his spiritual home. He also played for both Dundee clubs, his time at Tannadice coinciding with the start of Jim McLean's reign and allowing him to speak with some authority on both Turnbull and McLean, two of the more indomitable characters to manage in Scotland. Even in his eighties Turnbull still protests that it was only Gordon and himself in that Hibs dressing room who had the wit to appreciate the point he was trying to make. 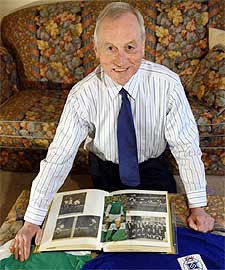 Gordon remained loyal to Hibs after his retirement from the game, although he never lost the conviction that a panicked Turnbull broke up that side before they fulfilled their potential. You can read more from Stuart Bathgate and David Hardie at the Scotsman website. That time of the week again when our thoughts turn to what's in store for the weekend. On a personal level I can look forward to another weekend of armchair sport and the very real risk of severe food poisoning. Scoreboard: 46 from 111 games. My failures have made me look at myself in a way I've never wanted to before. It's now up to me to make amends. And that starts by never repeating the mistakes I've made. If you'd enjoyed a 22 year career how would you dream of your retirement? Take your leave at the end of successful league campaign? Waltz off into the sunset with a cup win? Or enjoy a glamour testimonial before calling it a day? You probably wouldn't fantasise about the end coming with a two year ban. A two year ban received for getting sent off six times in the same match. But that's exactly the fate that befell Hawick United's Paul Cooper. Paul got a touch frustrated after getting his second booking in a match against Pencaitland. He unloaded his frustrations on the referee in what we can only imagine was an apocalyptic bout of swearing in which he chanelled the spirt of Malcom Tucker and Roy Keane. In the course of the tirade referee Andy Lyons brandished a further five red cards. I know it was my fault that I got into trouble. I completely overreacted after I had been sent off and I know I said things to the referee I should not have. But I felt so frustrated as I honestly wasn’t to blame for the incident that led to me being sent off. After the game I went to see the referee in his dressing room and I apologised to him for losing it and he accepted his apology. I was given the chance to go to Hampden Park in Glasgow but it meant taking a day off work and I couldn’t afford to do this so I had to wait until I got a letter to see what my ban would be. Unfortunately I’ve been in bother before with bans and I expected six months. But I was absolutely stunned when I got two years. I will just have to go with the flow, accept things and find something else to do on a Saturday. Paul's nickname, incidentally, is Santa. This was posted in the comment’s section a wee while ago but I didn’t publish it at that time because it wasn’t really relevant to the post in question. Quite topical tonight though, as Porto entertain Arsenal in the Champion’s League. It might all be rubbish, I don’t know (so all this is only alleged) but as it was sent to me I feel it is only right to share. It all makes our little conspiracies about the odd myopic ref seem a bit tame. For most Portuguese football fans, the brand "FC Porto" is a synonym of corruption. The leader of the club for over 25 years, Mr. Pinto da Costa, is well known for not only being the most successful executive in the football world, but also because of the corruption scandals, which seem to be constantly associated with him. Not long ago, Platini threatened to ban FC Porto from the Champions League because of the same scandal, which brought many referees and executives to the court. Nonetheless, FCP did not get the ban and Platini became a laughing stock in Portugal. Not even the Portuguese courts were able to punish FC Porto's chairman, since the phone records that proved his involvement in the major corruptions scandal were not accepted as proof by the court. Today the same phone taps, which were overruled by the court house, were posted on YouTube. The content is just a confirmation of what was already known by the general public. The tapes include mostly talks between the Portuguese executive and major characters of the Portuguese refereeing scene. According to the conversations Pinto da Costa literally handpicked the officials responsible for FC Porto's fixtures. Bribes are also a topic. Money is not specifically mentioned, but nonetheless prostitution is broadly discussed under the term "fruit" (prostitutes) and the term "milk and coffee" (which refers to Latin-Brazilian prostitutes), which were offered to referees. There is also another tape in which the Portuguese executive talks to the then-President of the Portuguese League, in order to ask him for a favor in a disciplinary case against Liedson for elbowing a FC Porto player. One of the most scandalous tapes for international fans is the one which involves Deco, the famous midfield ace. The Portuguese midfielder had thrown his boot at a referee after being sent off. Angry about this decision, Pinto da Costa asked a famous journal editor to publish an interview with Deco, in which the player would state that he would reconsider his place in the national team if he was to be punished for his actions against the referee. The forged interview was carefully prepared, as was the hearing at the League's Disciplinary Committee. Deco carefully followed the instructions of FC Porto's chairman and was not punished by the league - a true scandal. Now, Portugal eagerly awaits the outcome of this situation. Pinto da Costa has already filed a law suit concerning the leaked tapes. The Portuguese General Attorney is following the situation closely, trying to find those responsible for the publishing of those tapes, since they were held under a confidential status. However, the question remains: How could Pinto da Costa not have been punished by the legal authorities? Many suspect that Pinto da Costa also has some influence within the justice system, which is not too far-fetched. He has enjoyed some very intimate relationships with many famous politicians who still have a large influence in the legal system. A "Godfather" plot in Portuguese. I doubt most of you understand the Portuguese, even with subs, but still. Here it is. The comment was made anonymously but it is lifted from a Bleacher Report story from January and written by Jose V Rodrigues. See the original here. The annoucement of Celtic’s financial performance over the past year could probably have come at a better time. With their hope of even making Rangers fight for the SPL title all but evaporated the last thing the Celtic fans needed was a tale of cash woe rather than cash flow. The results showed a drop in turnover, another drop in profit and a rise in debt. Now I have the financial sense of Sir Fred Goodwin but even I can tell that when it comes to matters monetary you want the two that dropped to rise and the one that rose to drop. For all that, however, this latest batch of accounts is hardly the Wall Street Crash of 1929. It seems unlikely that Celtic are going to be forced to endure an Ibrox style era of austerity any time soon. What is clear is that the poor showing financially is driven by poor performances on the pitch and that is a trend that Tony Mowbray seems powerless to stop at the moment, a major managerial failing that is hardly going unnoticed by those within Celtic. The funny thing is Glagow is a place criss-crossed with envy right now. Riven by years of hatred, rivalry and competition, the Old Firm each have something the other wants. Rangers look at Celtic’s accounts, even in these straitened times, and think, 'if only'. Each time Celtic sign a player it exposes Rangers’ inability to match them cheque for cheque. On the other hand, Celtic look at Rangers’ ten point lead, compare it with their own shaky defence and think, 'if only'. Each time Rangers win a game it exposes Celtic’s inability to match them point for point. So basically the Old Firm right now is made up of two half clubs. One sorted on the pitch, one sorted off it. Am I being stupid in thinking that the solution is blindingly simple? We need, nay demand, that a Glaswegian Wallace Mercer is found. We need a man with the vision of the great Wallace, someone who can take these two fine institutions and merge them into one all-conquering outfit. The time, ladies and gentleman, has arrived. Glasgow United is the way to save Scottish football. Let’s think for a moment about the possibilities. European success would be almost guaranteed as a combined Rangers and Celtic would immediately become one of the biggest clubs in the world. Such would be there global clout that they would be able to compete, dominate even, from within the SPL thus removing any chance of them moving to England. With only one Glaswegian side the extra Champion’s League place would be opened up, creating more competition from the rest of the SPL clubs and giving the “provincial” clubs the elite level experience they would need to compete at home. Ibrox or Celtic Park could be expanded to become the finest football stadium in the world. Take that, Wembley. The other could be gifted to the SFA who could then sell Hampden and use the funds to revolutionise youth football in Scotland. Moreover by embracing the separate history of both clubs Glasgow United would be sending out a powerful message to the world. In any corner of the globe scarred by religious discord or ignorant bigotry, Glasgow United could stand as a beacon of hope. It’s not too much of stretch to believe that that the red, white, blue and green stripes of the new club’s jerseys would become a more potent symbol of peace than the United Nations. This is the future, folks. Who's with me? If there's one thing the English Premier League enjoys, then it is spreading the influence of the "Best League In The World." Like a benign corporate John Terry, this is a business concept willing to spread the seed of happiness around the globe. From cheap polyester shirts to the cult of Beckham, from a football model based on nothing but hard cash to the, literally, unmissable charisma of Jamie Redknapp. The world wants English football and English football is happy to give of itself with the generosity of a text message from Ashley Cole. We can but look on in awe as the English behemoth bestrides the globe. English football is the global currency, a lingua franca with the vocabulary provided by Andy Gray. Those of us condemned to follow Scottish football can only eke an existence in the shadows, a nation of Wayne Bridges in a world of Hugh Hefners. Thankfully the men in charge of English football are no strangers to self awareness. They know their worth, the power of their every utterance. They realise that a meeting of the powerbrokers in the English game has taken on the global significance of a modern day Yalta Conference. So it is that we are given the privilege of sharing in their every discourse on how to do the charitable thing and spread themselves even more thickly upon the global consciousnes. The 39th game? The entry of Rangers and Celtic? Mere philanthropy. Like the British imperialists of old spreading civilisation across the planet, they are but doing their moral duty. Any money made in the process is a necessary evil of allowing a billion Chinese the chance to watch Bolton play Stoke. When we are lucky enough an idea will occasionally spring from this crucible of humanity that, with the humility of the tenant famer accepting scraps from the squire's table, we might adopt to bring sustenance to our own, malnourished game. Yesterday was one of those red letter days. Still hurt that few of the disciples were willing to accept the self sacrificing missionary work that would have spread the gospel in the form of the blessed 39th game, a new hymn was sung. The light of democracy would shine throughout English football in the form of play offs for the fourth Champion's League spot. The 39th game would be replaced by a series of games with the ultimate prize of a place in the qualifying rounds of the continental behemoth. Thus the quad-opoly of the Big Four could be broken and the unique excitement of the "Best League In The World" could be stretched over an extra few weeks. Any money made in the process would, of course, be a necessary evil of allowing English football to give yet more of itself to the global village. Now, is it just me, or is this not a blueprint for our own future? There are surely only benefits. Old Firm complaints that the lack of competition at home renders them impotent abroad? Sorted. Win the league or risk losing the Champion's League place. That should offer the higher stakes of real competition. Ten teams fighting it out for nothing more than third? Sorted. Finish third or fourth and you could be but two or three games away from taking the prize of second place anyway. Too many meaningless games? Sorted. There would still be a lot of meaningless games. But Hibs and Hearts playing off for the right to play Rangers at Hampden with the Champion's League at stake? That's got to be marketable. There's too many games already? Sorted. Listen to what our English cousins are saying. The English Premier League has already found the answer. Not too many games, not enough games. If there is a risk of people losing interest in a product simply give them more of the product. It's a no brainer. Other teams would struggle in the Champion's League? Well, really? Who are we comparing them to? The all conquering Old Firm? And it's only by exposure to the top level that our "provincial" clubs can truly aspire to greatness. It would be unfair on the team finishing second? No, it wouldn't. Look at the existing cup competitions. Rangers and Celtic would most likely take the majority of the play off titles. But every so often they would lose. And that would be as refershing for our game as a dose of Shake 'N' Vac on a musty shagpile. And it need not stop at the top. A four way play off at the bottom. The second placed team in the First Division and the teams finishing 9th, 10th and 11th in the SPL. Those meaningless fixtures are disappearing over the horizon. Let's get this done. English football sneezes and we get a cold? Good, let's get swine 'flu. This English proposal gives us the chance to stand on the shoulder of giants. This is our chance to march into the sunlight. Scottish football will be reborn thanks to the TV evangelists of the south. When the "will he, won't he" debate about Andrew Driver's international future began, I think it was sometime back in 1901, there seemed to be a number of possible conclusions to the saga. The outcome that was least discussed, although it was the one we should have prepared for all along, was that the SFA hadn't actually done their homework. 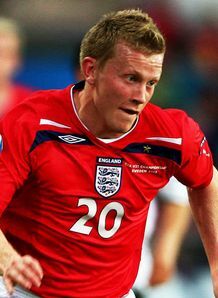 And so it came to pass that Andrew Driver's Scotland career was the shortest in international history, lasting all of 24 hours and the heady total of zero caps. Not eligible, you see, never has been. In all the wooing and flirting, as Gordon Smith got hot under the collar talking about a young man trapped between two lovers, as his decision to become a Jock was breathlessly announced, in all of this someone had forgotten to check if he was actually qualified to play for us. Turns out he hadn't completed the full period of education that is required under the new rules. Beneath the tan I think you could say that Gordon Smith has got a bit of a beamer. I've felt all along that the Driver scenario - and the player's refusal to commit - was making a mockery of a rule that should have been a positive attempt to reflect modern Scotland. But to find out the whole debate has been based on a false premise? Another moment of mindblowing SFA genius. I feel embarrassed to have nailed my colours to the mast of Scotland, only for this to happen. I feel the SFA should have investigated everything before asking me to commit. I'm a bit annoyed and disappointed this has all come out so late. Hmm. Embarrassed, annoyed and disappointed by the SFA. We know the feeling, mate. 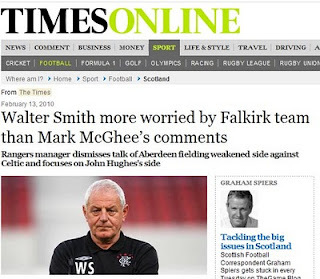 Amazed to hear that Walter Smith's concern for the SPL's bottom side trumps his worries about the title race. Or maybe Hibs can be cautiously optimistic that Smith has got the fixture list completely wrong? Or another sign of how the English media just don't care about Scottish football? What my old subbing tutor used to call a "howler." The mistake was first pointed out on Friday night but remains in place this morning. At least The Grauniad tends to correct errors when someone notices them.